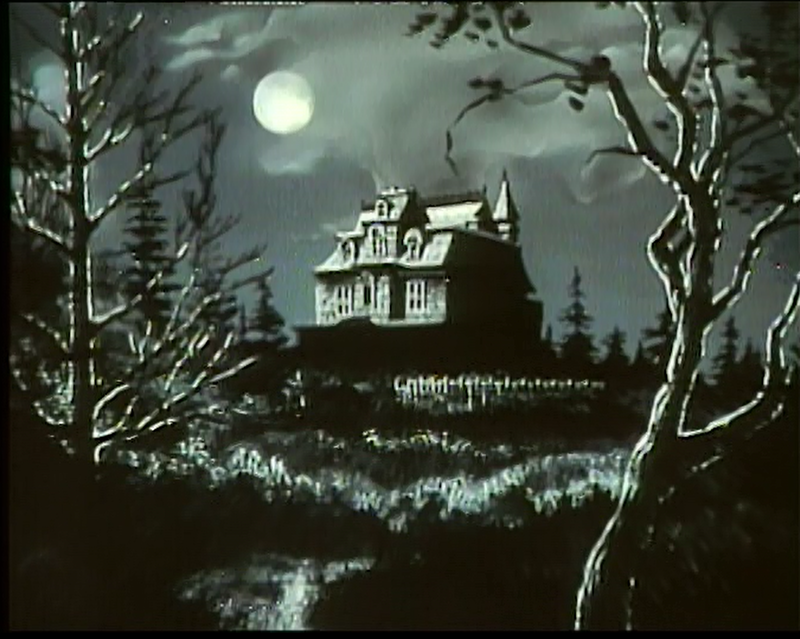 Just a few years after the highly-rated Night Stalker movies premiered to high ratings and one year after the Kolchak (1974-1975) TV series, Lou Scheimer’s Filmation created a kind of comedy variation on the premise for Saturday mornings. The series ran for fifteen episodes, and is most famous, today, because it landed in the pop-culture nearly a full-decade before the similarly-named blockbuster Ivan Reitman movie of 1984. 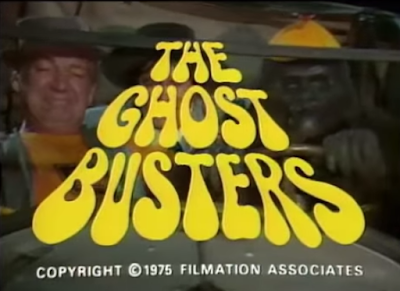 It should be remembered by all that this series spearheaded The Ghost Busters concept (which includes anti-ghost technology, a team of inept investigators, supernatural foes, and slapstick comedy) well-before the 1984 film also went there. After 1984, the two versions of the material duked it out in Saturday morning cartons, one based on the 1970s Filmation program, the other one based on the popular movie. 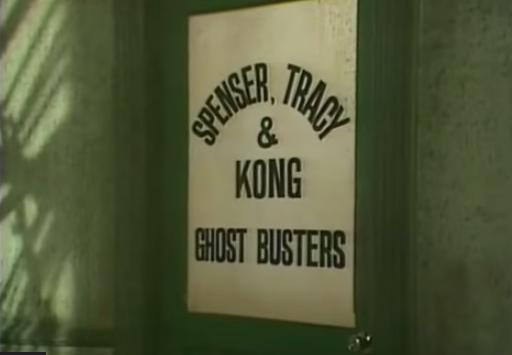 In the original series, Spenser, Kong, and Tracy receive assignments, Mission: Impossible-style from self-destructing tapes, and then go after various monsters or legends, including the Mummy, the Frankenstein Monster, evil witches, and even Dr. Jekyll and Mr. Hyde. The first episode of the series is "The Maltese Monkey," A bizarre riff on the classic film noir, The Maltese Falcon (1941). 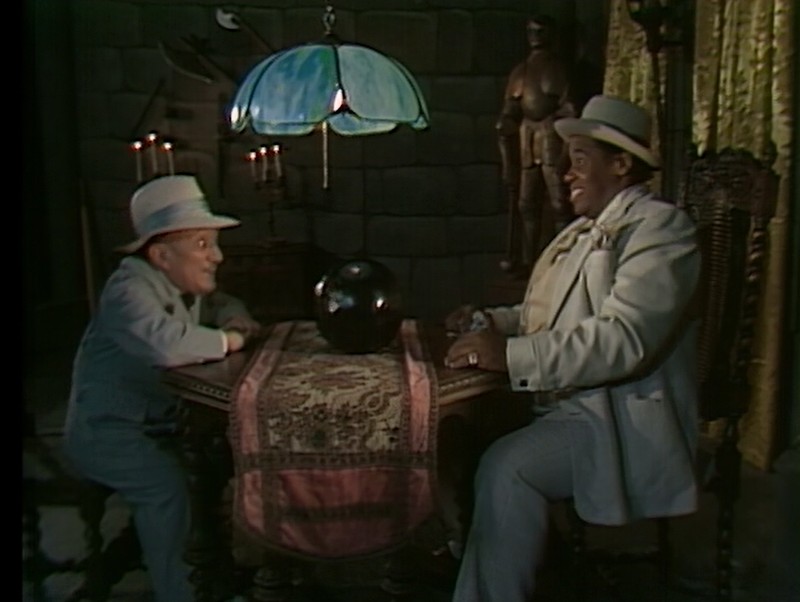 The evil duo the Fatman (Johnny Brown) and The Rabbit (Billy Barty) use a crystal ball to conjure the ghost of notorious gangster, Big Al (Larry Storch). 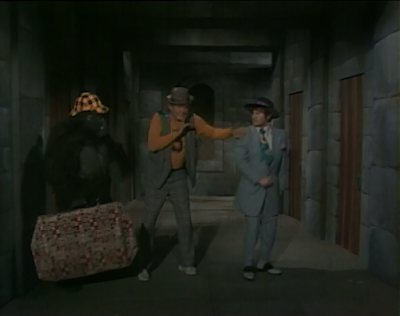 Only Big Al knows the secret location of the "thing," the valuable statue, The Maltese Monkey. 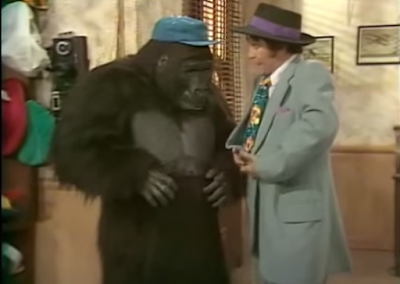 Spenser, Kong, and Tracy are ordered to apprehend the Fatman and the Rabbit, but are shocked to learn that Big Al and Spenser are dead ringers for one another, right down to a taste in fashion. At first, Kong plans to use Spenser's resemblance to Al to trick the evil duo, but Big Al pulls a fast one and gets Tracy and Kong to steal the Maltese Monkey with him. Although its humor is incredibly juvenile, "The Maltese Monkey" is cartoonish on purpose, I would assess. In fact, it pulls -- in its freshman episode, no less -- a cartoon gage that kids could watch on Scooby Doo every week. The joke involves a corridor with doors on both sides of the chamber, and people emerging and disappearing, alternately, on each side, in several doors; in defiance of physics. It's an old, stupid joke, but it captures, almost perfectly, apparent ambition to be a live-action cartoon. This is a show clearly designed for kids, and yet there are some fascinating things to consider here. 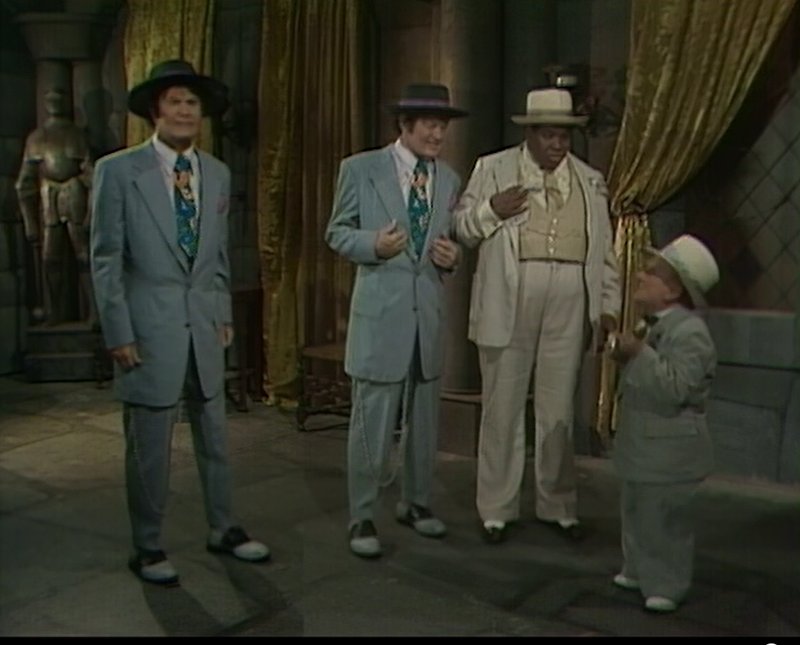 First, "The Maltese Monkey" features relatively well-shot split screens for various compositions, pitting Larry Storch against...Larry Storch. I wasn't expecting that degree of visual sophistication from such a cheap production. 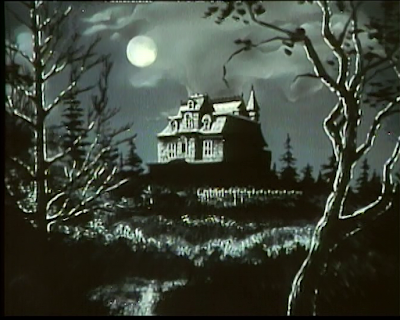 To the negative, however, the castle as depicted in the film appears to be a drawing or painting, and at one point during the aforementioned corridor chase, one can see the flimsy walls actually shake. But, again focusing on the positive, Larry Storch goes for broke in both roles. 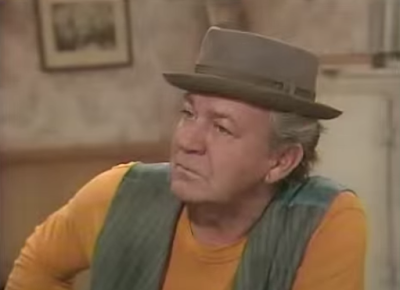 He plays Spenser, and Big Al. 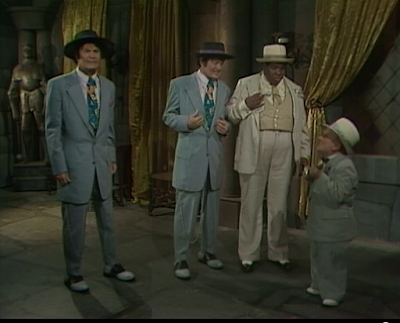 But then he plays Big Al pretending to be Spenser, and Spenser pretending to be big Al. As Big Al, he performs a flawless imitation of Marlon Brando from The Godfather (1972). 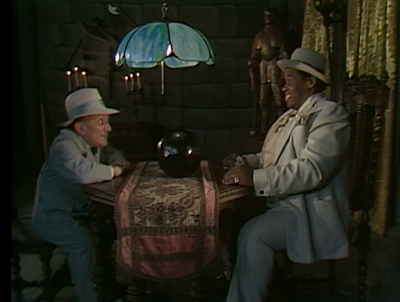 And as Spenser imitating Big Al, he pulls an equally perfect Jimmy Cagney. I confess to not being a very big fan of this Saturday morning series, and for finding the humor, for the most part, cringe inducing. Still, I'm going to blog the whole series here with an open mind, and see how it shakes out. One quality I do appreciate about this series is the "monsters for kids" aspect. Children are fascinated by horror films and big screen monsters, and those obsessions are definitely here. It's just that they are couched in the most ridiculous scripts and situations impossible, presumably to make sure the terror isn't merely tolerable, but toothless. 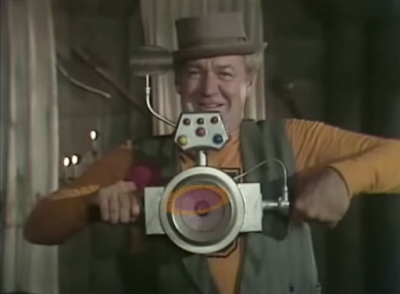 John, I am pleased that you are reviewing Filmation's original THE GHOST BUSTERS. I was a boy in '75 and I watched this on Saturday mornings because of F-TROOP's Spenser (Larry Storch) and Kong (Forest Tucker). I liked F-TROOP reruns. It was goofy, but as a kid it still made me smile.